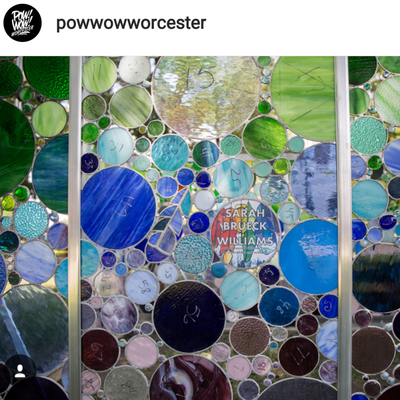 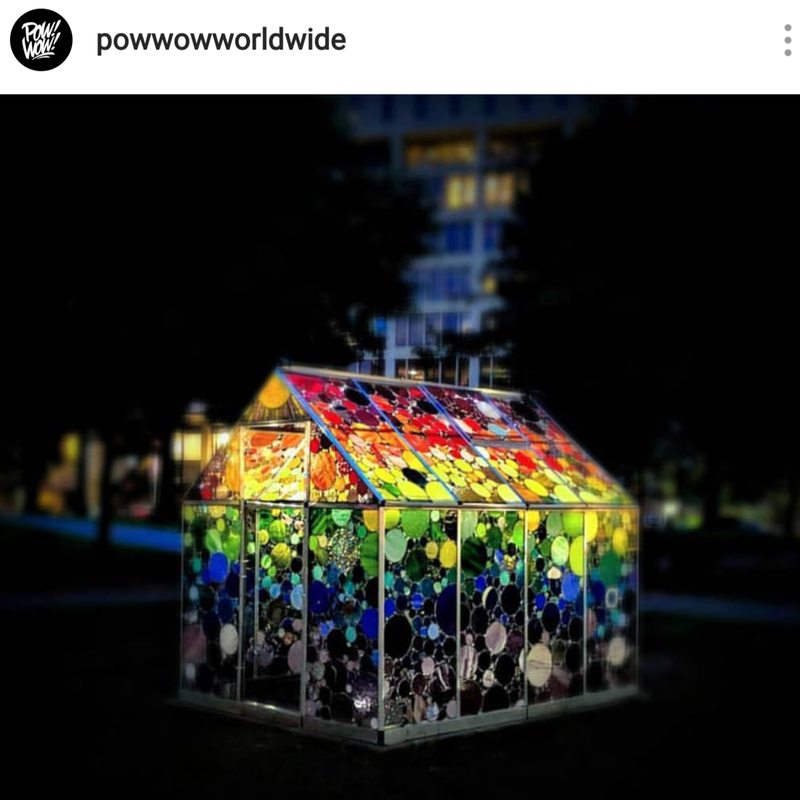 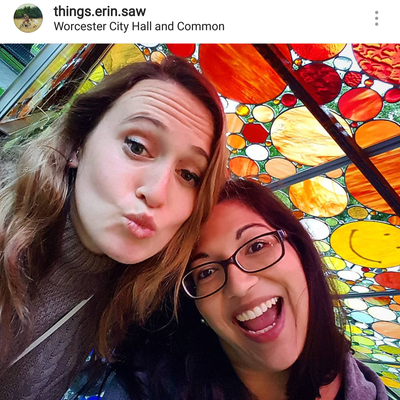 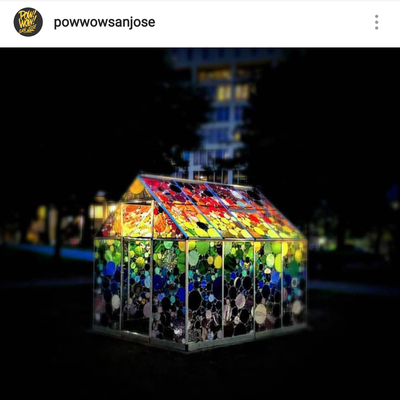 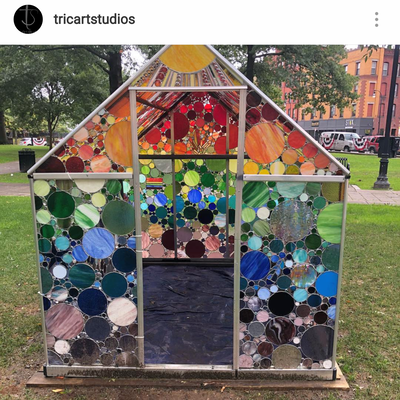 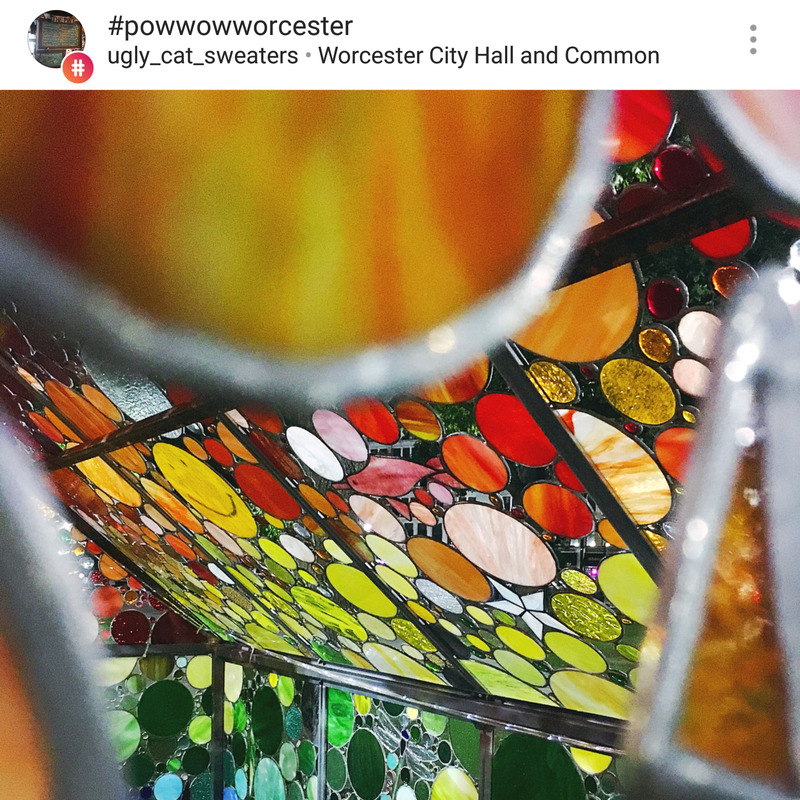 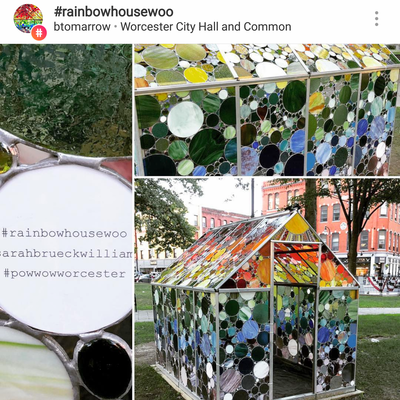 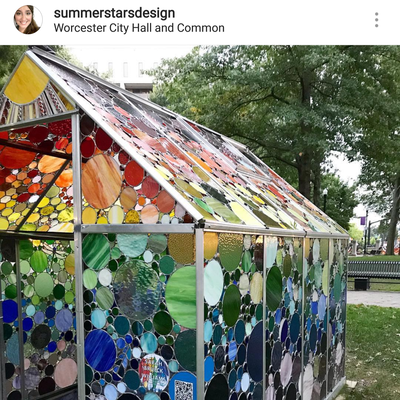 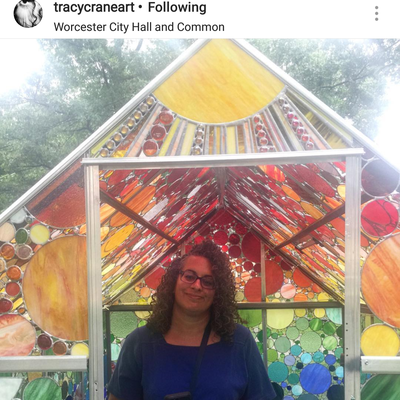 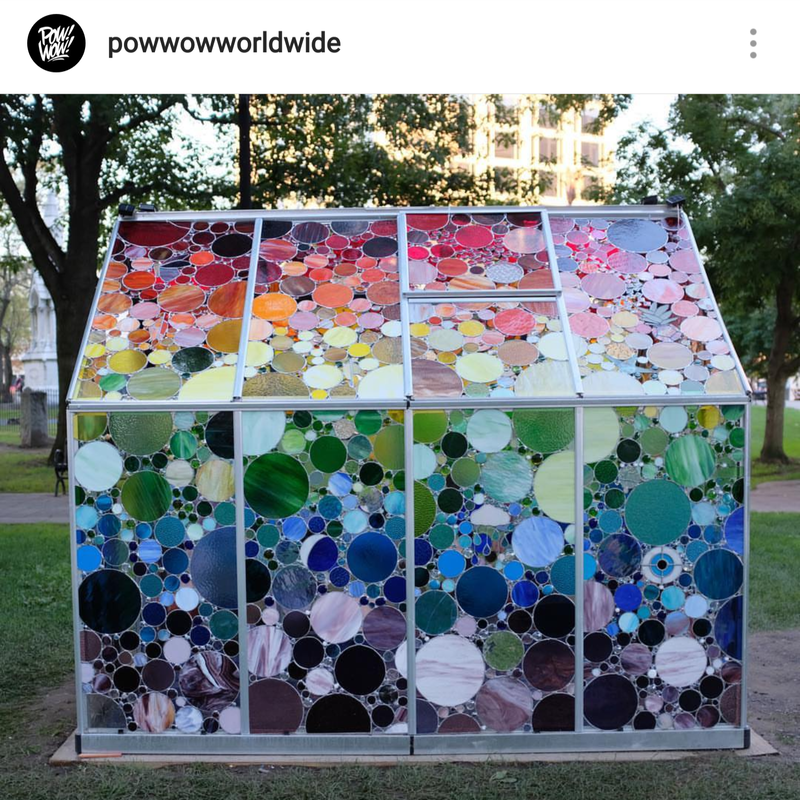 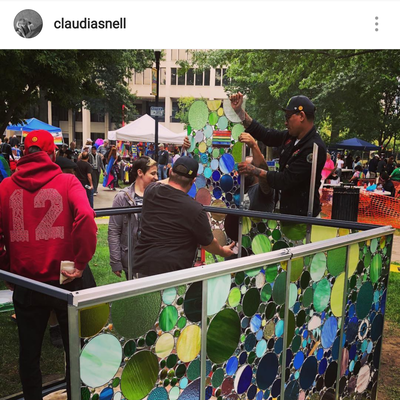 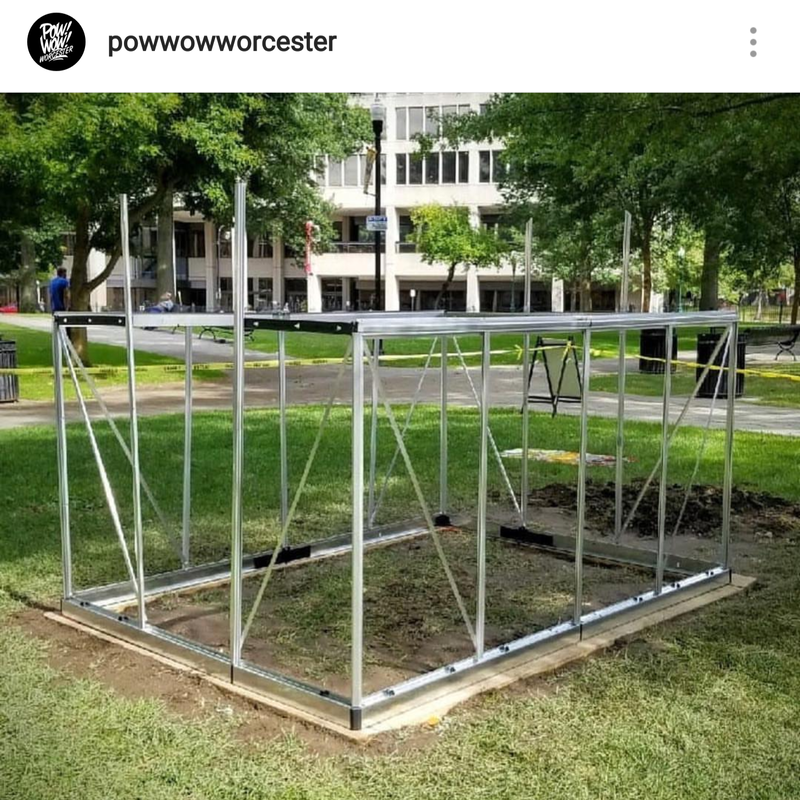 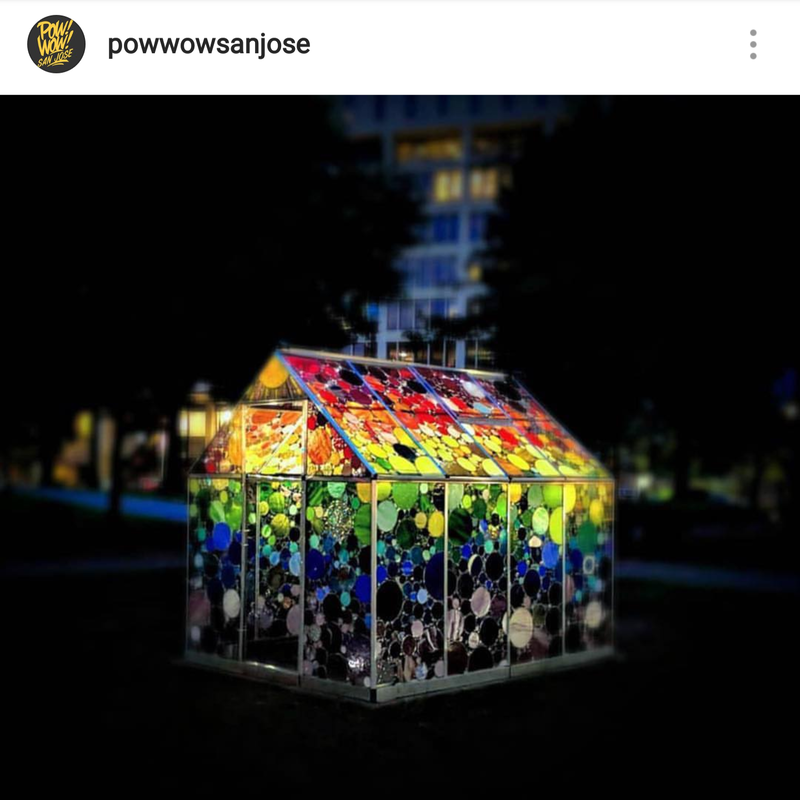 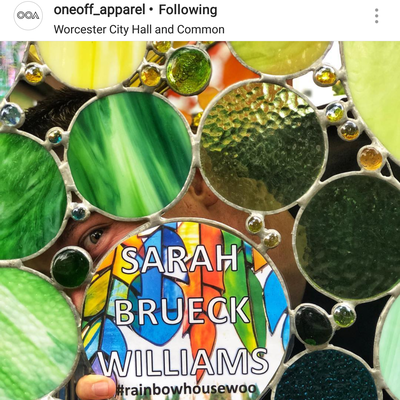 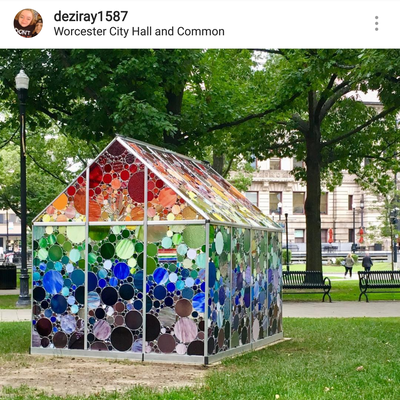 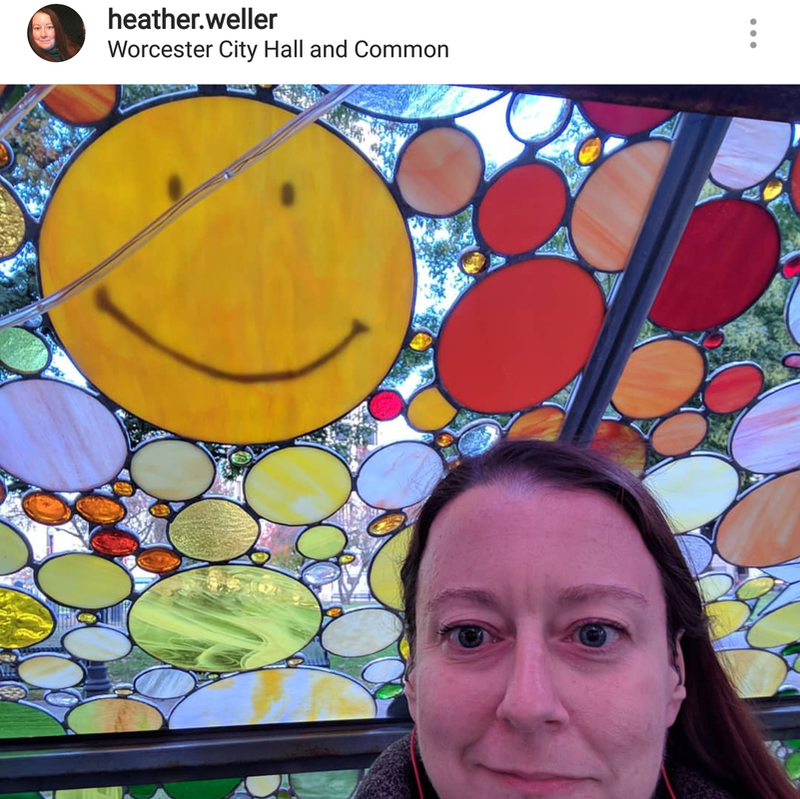 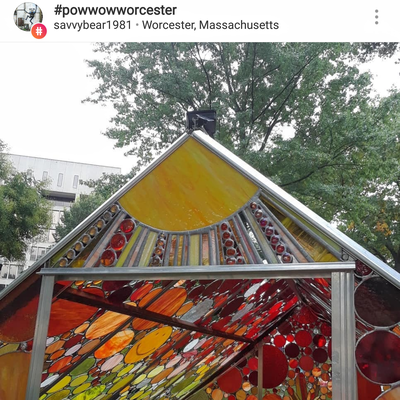 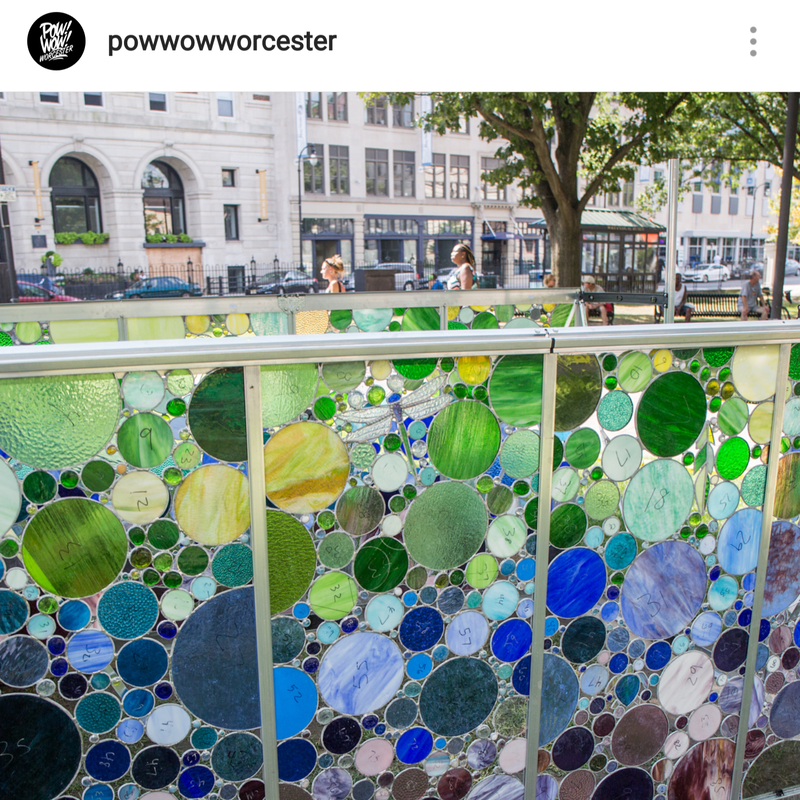 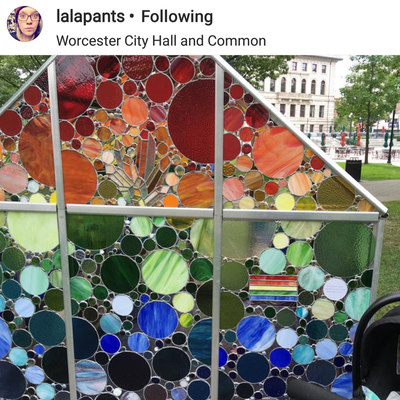 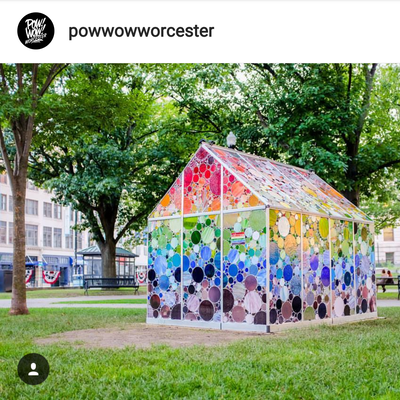 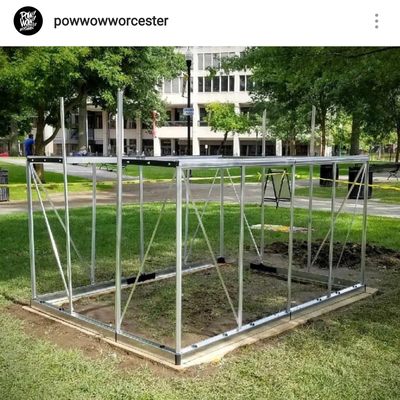 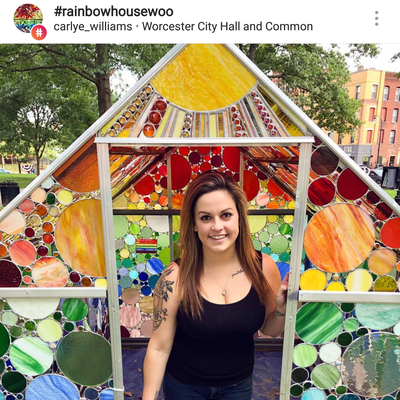 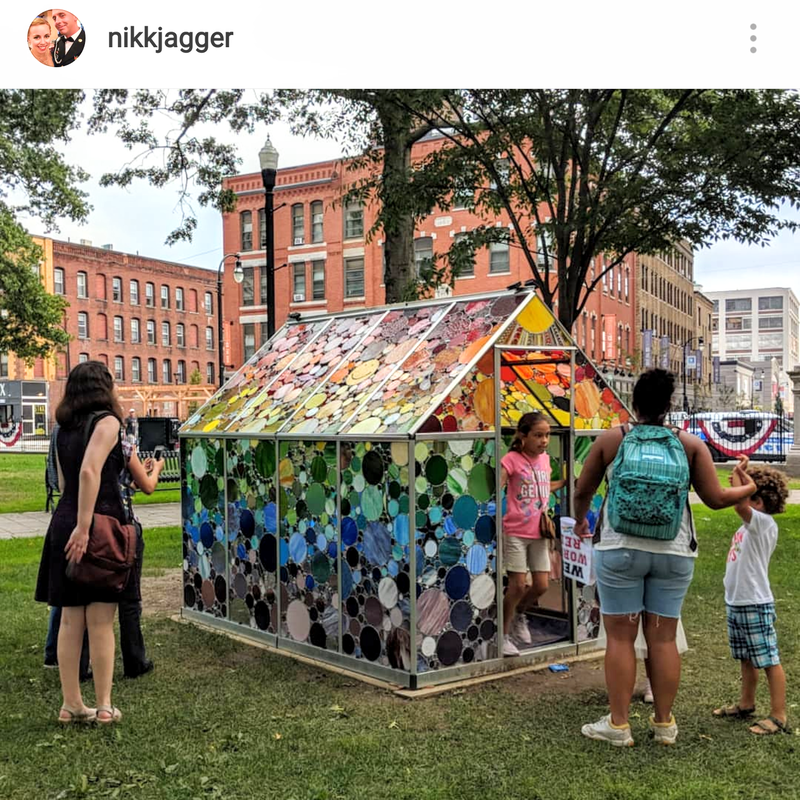 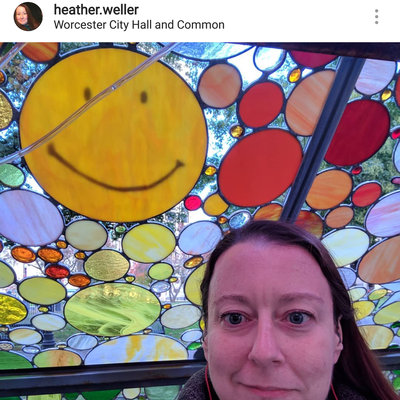 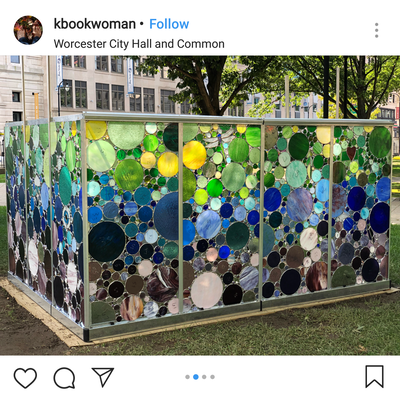 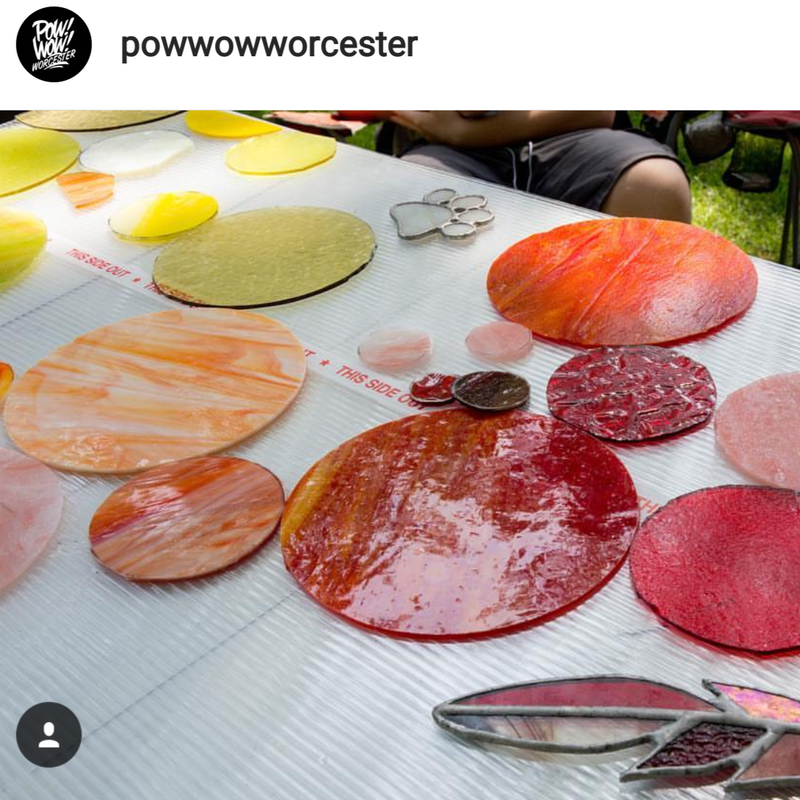 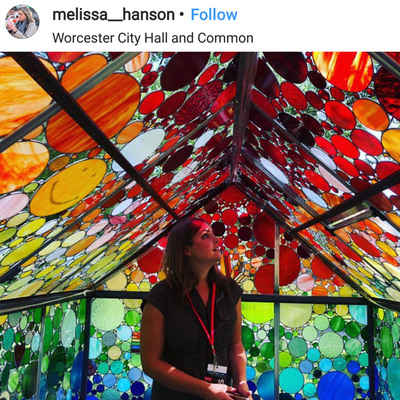 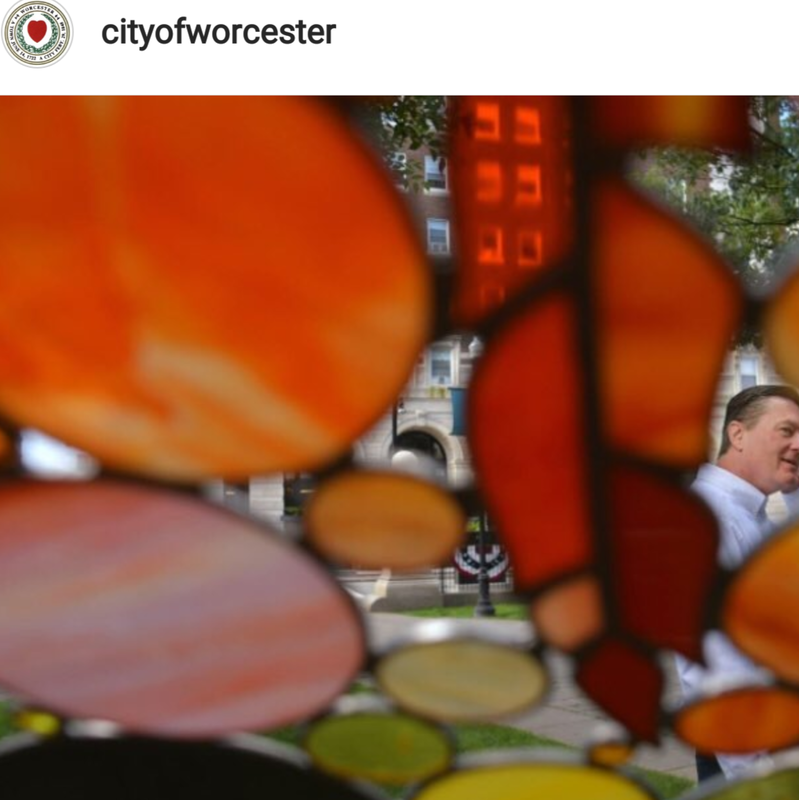 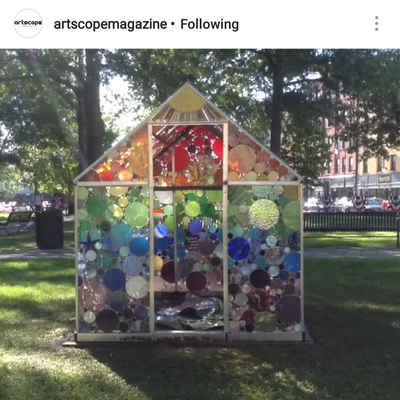 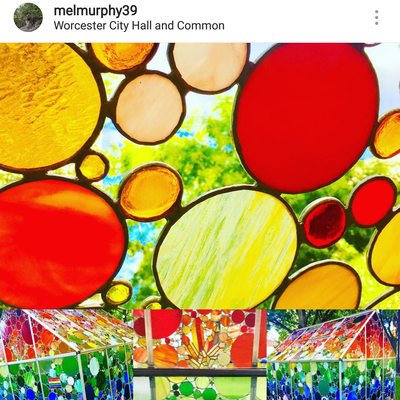 In September 2018 I created an art installation as part of the Pow!Wow!Worcester public arts festival in Worcester, MA. 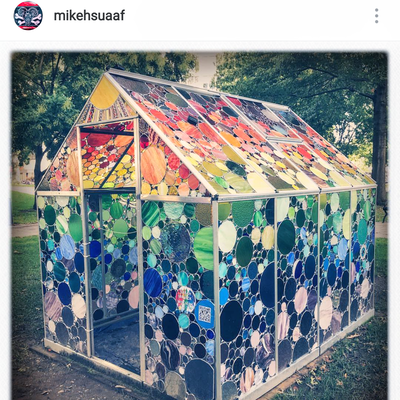 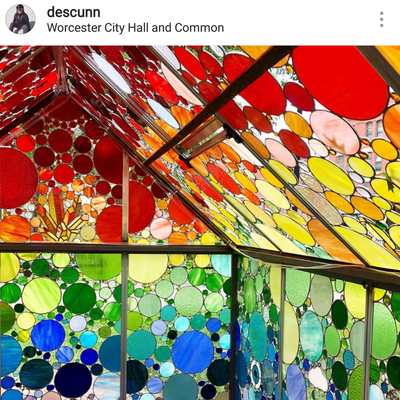 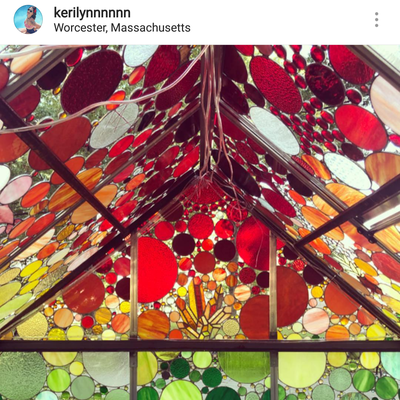 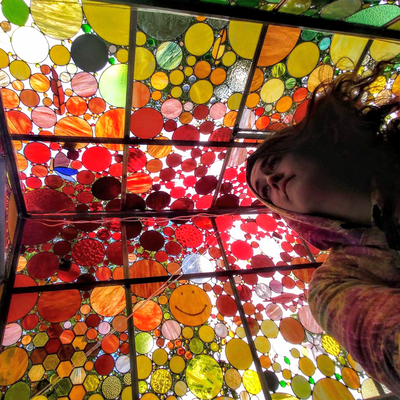 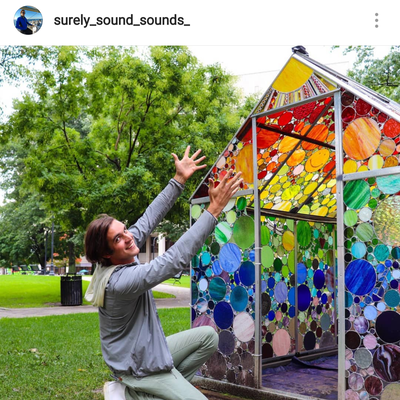 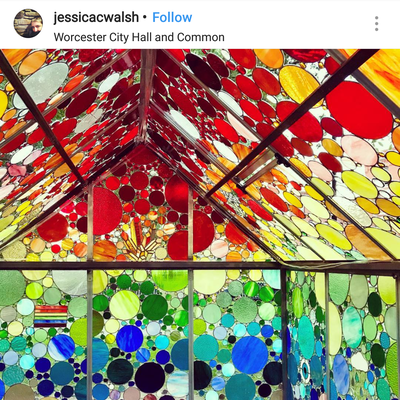 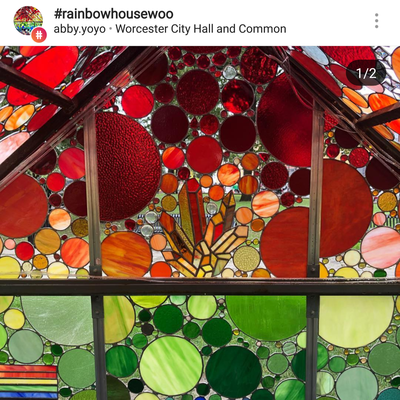 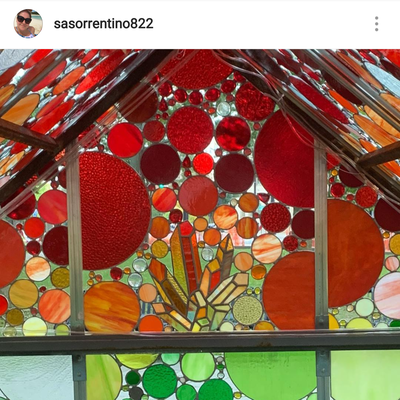 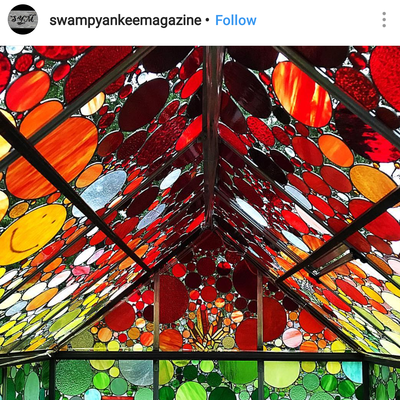 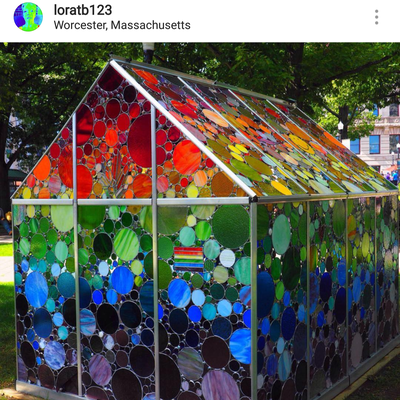 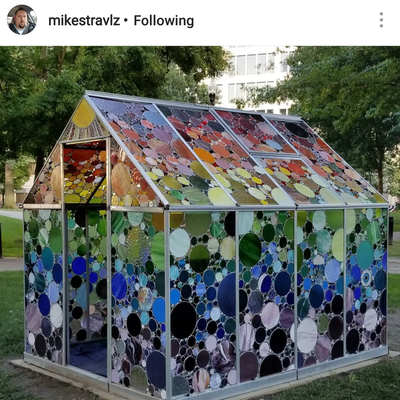 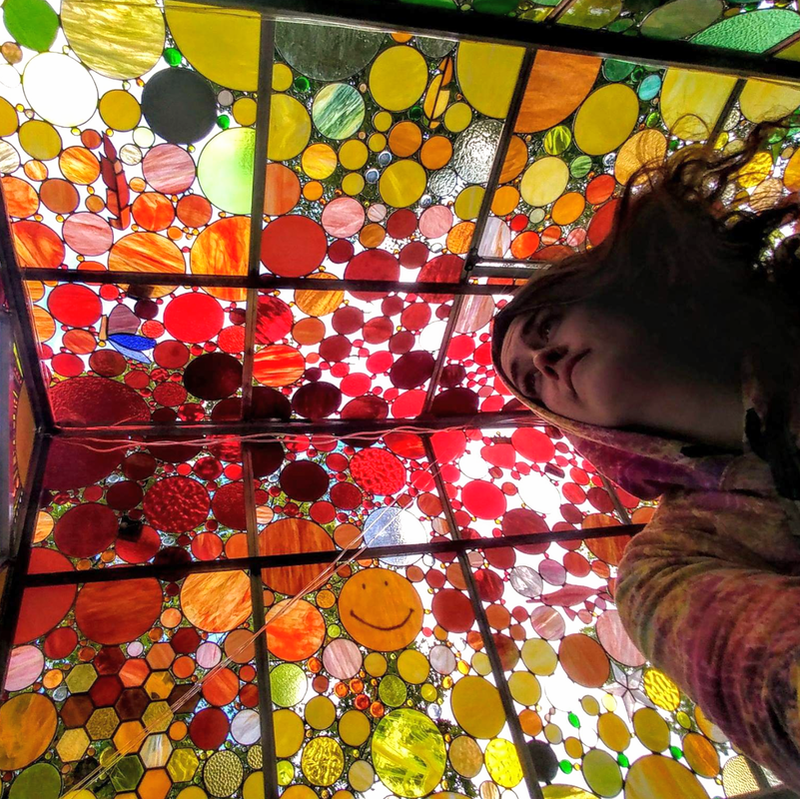 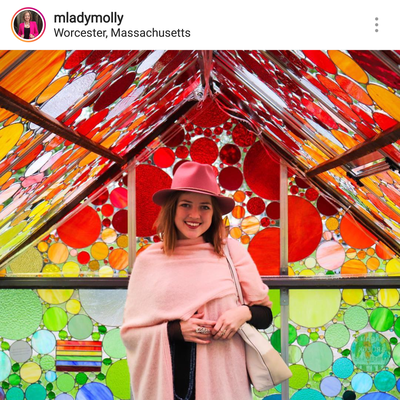 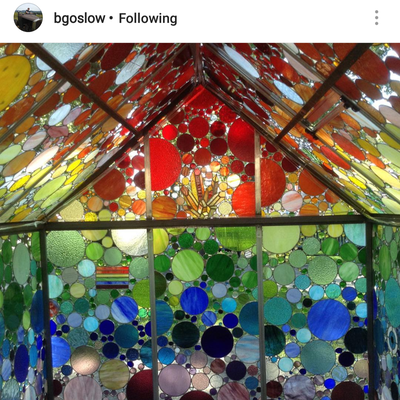 My mini glass house was made up of panels of stained glass - mostly in circle panes - in a rainbow ombre palette. 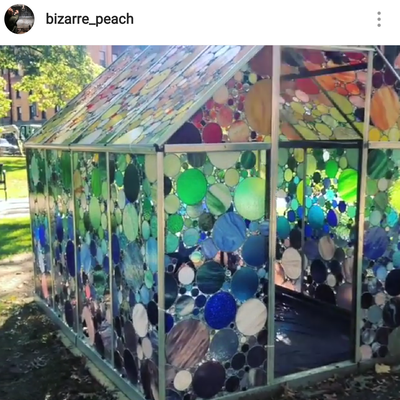 I stopped counting after awhile but I believe 300-400lbs of sheet glass were used in the house, in addition to 75 lbs of glass nuggets. 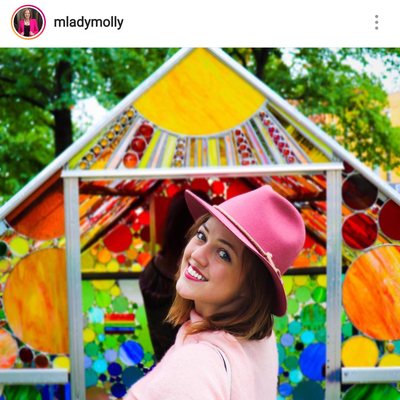 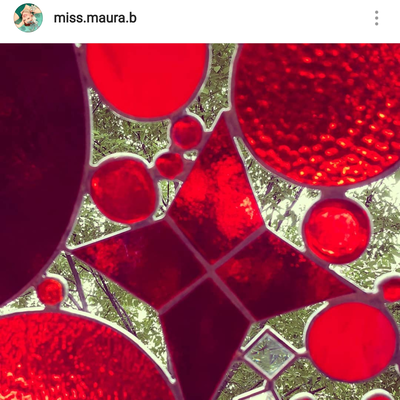 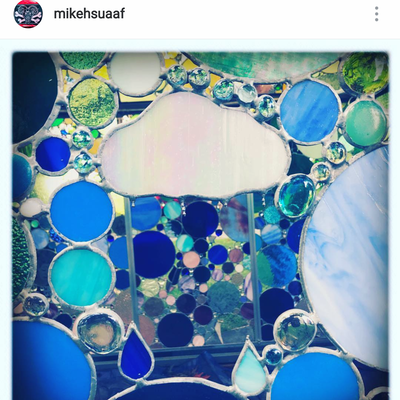 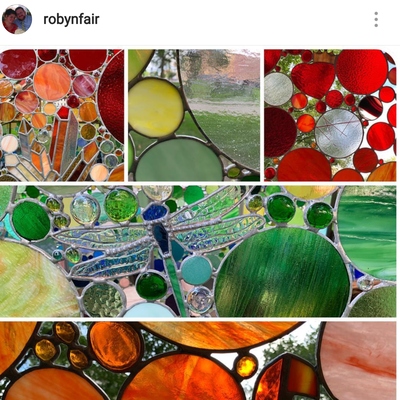 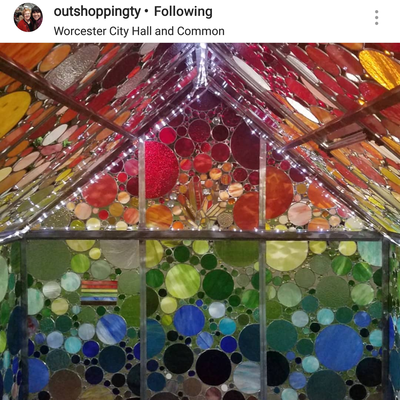 Fellow stained glass artist The Pomegranates Crown donated 12 green, blue and purple circles - check out her amazing unique work! There are numerous hidden images among the glass circles - some have personal significance to myself and to those who helped with the house - some are completely random! 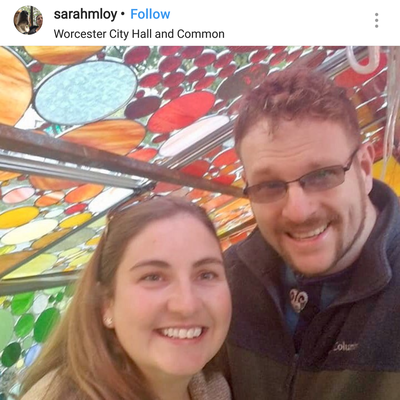 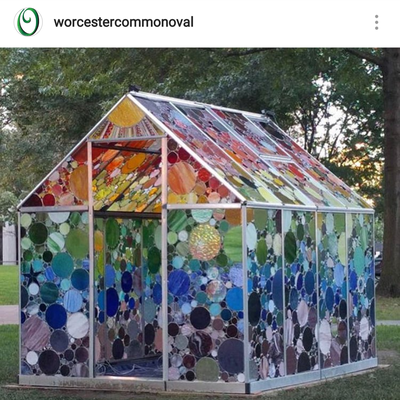 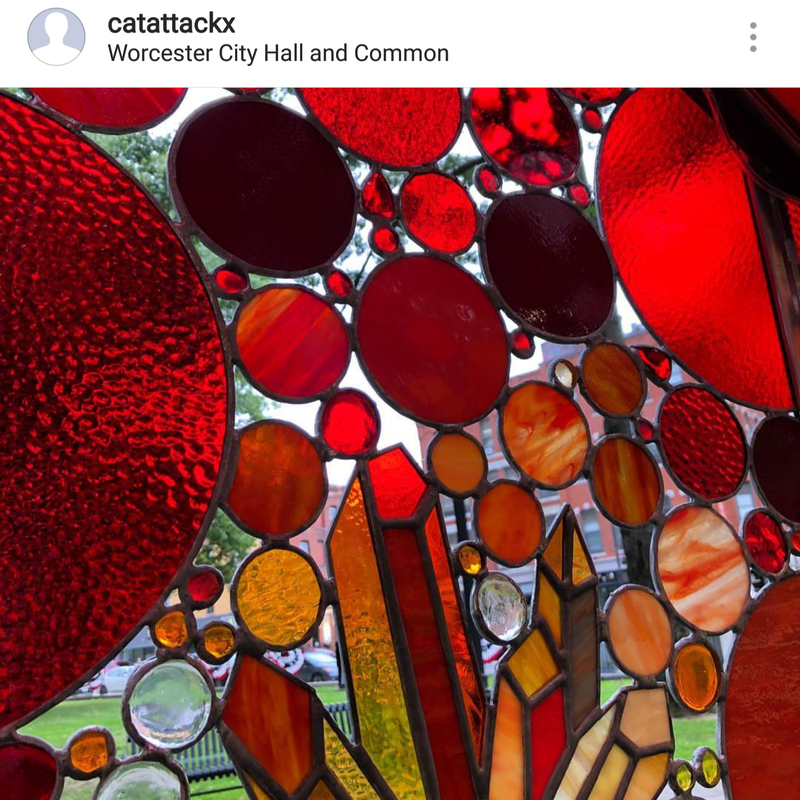 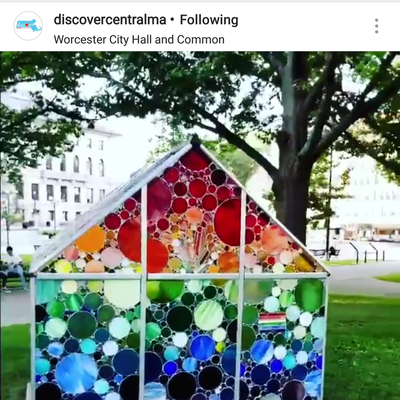 Included were: stars, a moon, the sun, crystals, a sea turtle, a paw print, a Pride Flag, a cactus, honeycomb, a heart with a crown, a cloud with raindrops, a safety pin, The State of Massachusetts with a heart (Worcester is the Heart of the Commonwealth! 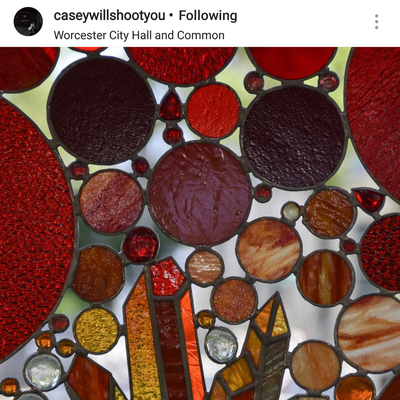 ), six of my original feather patterns, an evil eye, a dragonfly, a butterfly, an Amazon Pink River Dolphin, a smiley face (originally created by Worcester's own Harvey Ball) and a shape that looks like a pineapple, but it's actually a 2 dimensional version of a succulent (a propeller plant) in a (dodecahedron) terrarium made from orange glass. 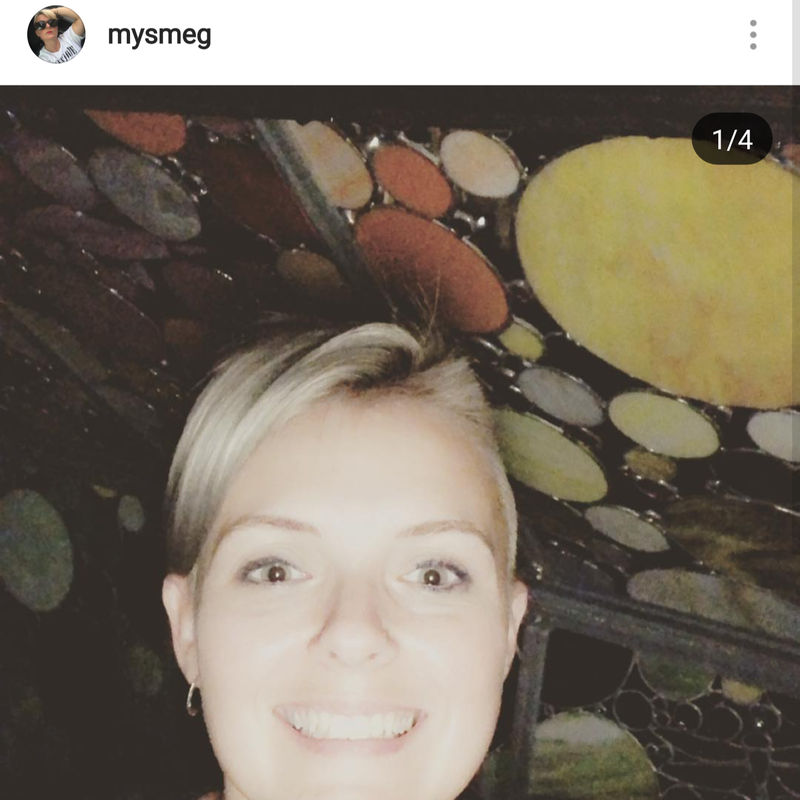 There are probably more but I lost track after week three!